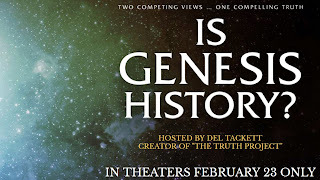 In February, I'll be in California for the debut of Is Genesis History? and to speak at the 2017 Science Summit at the Master's University. Is Genesis History? is a documentary film featuring yours truly talking about created kinds, along with a bunch of other creationist researchers talking about their research. It will be in theaters only on February 23. Check their website for theater information and tickets. During the same trip, I'll be speaking at the Master's University for their Science Summit, "God's First Man." My presentation will focus on Neandertals, but I'll probably throw in some bonus stuff about Homo naledi. Can't resist. This year, there are three hundred tickets available, and you can get yours online at their website. Then in March, I'm off to the Smoky Mountain Creation Retreat in Pigeon Forge. If you don't know what it is, click that link below and check it out. Tickets are going fast, so if you want to go, you should get your tickets soon. Feedback? Email me at toddcharleswood [at] gmail [dot] com. If you enjoyed this article, please consider a contribution to Core Academy of Science. Thank you.